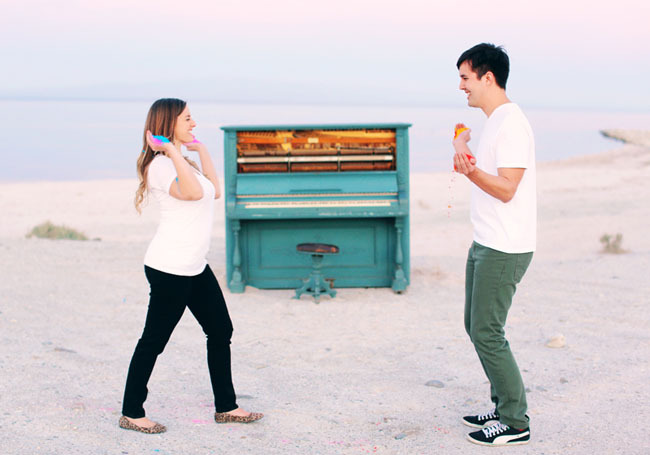 Engagement Shoot – Holi Inspired! 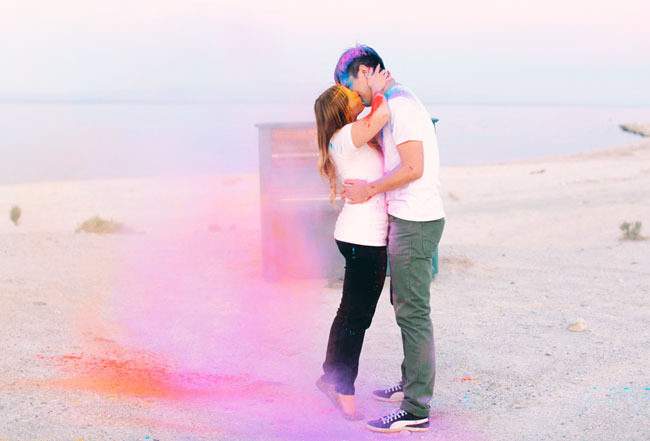 In the spirit of Holi celebrations, it’s amazing to see how many engagement photo shoots have been inspired by the holiday and its tradition of “Holi powder fights”! In our personal opinion, this is the best type of photo shoot because not only does the finished product give you gorgeous and colorful photos, but, it also allows the couple to let their guards down and enjoy the experience [which for some can feel uninspiring and stressful]. Here are some of our tips to ensure the couple enjoys a fun and safe Holi Powder engagement shoot! Decide boundaries beforehand (ie. are there limits to where you can throw the powder at each other?) NOTE: Make sure you THROW the powder and not smear! The colors will stand our greater if you wear white clothing and have a simple backdrop (i.e.. a beach, a park with a clear sky). For engagement photo questions or if you want to plan your Holi inspired photo shoot, please contact us! Don’t forget to visit our friends at Masalamommas, where we talk about other colorful tips to celebrate Holi! Thanks to Green Wedding Shoes, Benj Haish and Carolyn Scott Photography for your inspiration and capturing these great moments! Last Minute Tips – Hosting The Best Oscars Party! It’s that time of year… Oscars Time! Great fashion, beautiful people, excellent films – it’s one of the few award shows we all enjoy watching (until it gets to the lull in the middle where they announce the categories most people don’t care about!) Nevertheless, any excuse to have a party and celebrate friends is always worthwhile! 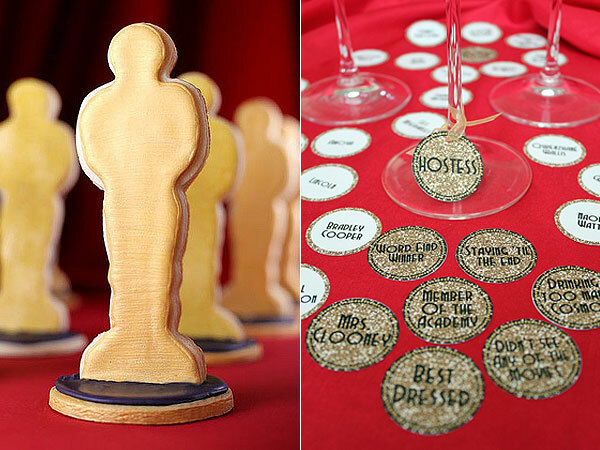 Below we give you some last minute tips for a fun, creative Oscars party! Attire: for a “formal” evening, tell your guests to dress black tie (suits & gowns). For the more low key evening with friends, black tie casual should do it! Decor: keeping in theme, we recommend sticking to black, white, gold & red! Offer up a fun “red carpet” carpet that your guests can walk into by using simple red construction paper at the front door entrance! Also, you can buy some red velvet fabric and hang it up around a TV as curtains. It will look just like a movie theater! Food/Drinks: Keep it classy with some bottles of wine & champagne. Throw in some fruit at the bottom of the glass (strawberries, blueberries, raspberries) for a dash of color! Also, you can’t watch a show about movies without some salty snacks! Add another DIY touch with creating mini popcorn bags you can leave out on the table for guests to grab. Simple microwave popcorn will do the trick and then you can divide up into the mini bags. For a sweet treat, you can make cookies or cake pops in various colors and assortments. Throw in a bow tie, gold stars or the Oscars statue! Games: We realize this is a 3+ hour long show that will lull from time to time. To keep things entertaining for the guests, there are various fun games to incorporate with the awards show. How about a running list of picking your favorite awards and have everyone guess who should win. In addition, a Bingo board can be a unique way to incorporate the actors, directors, writers and other nominations of the evening. Or, to get the whole group together in one activity, you can divide into teams and play catchphrase! Set up index cards with words/names/things associated with the Oscars. You can create a prize for each game that the winner can bring home! Other fun details to add to your night: traditional film rolls, DIY “movie tickets”, gold star stickers you can put around the room and/or use for game pieces. Lastly, we think keeping some disposable cameras around the party can make for fun photos and can be kept for scrapbooks and other fun memories! Check out some visual inspiration of our ideas on tanaRi events Pinterest page! For any questions about planning social events, contact us at info@tanarievents.com!